Road. Nirvana for cycling? Err, no. 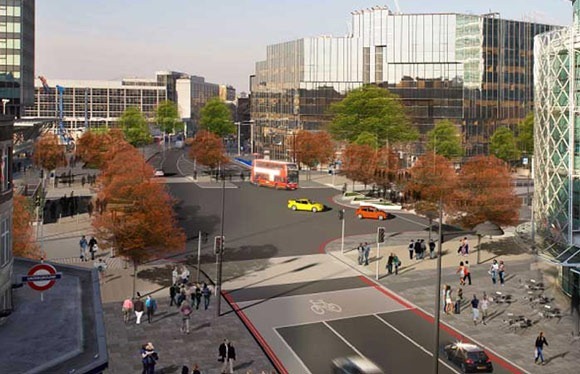 Back in January, Transport for London issued its proposed re-design of Euston Circus for consultation. This is the junction at the top of Tottenham Court Road. It's a place with six lanes of motor traffic and virtually no safe, sensible bike access either north- or southbound. Not unless you like playing hopscotch with buses and lorries. So, you might wonder, what is TfL proposing to do here to make the junction safer for everyday Londoners to get on their bikes and hop over the Euston Road into town? Well, it proposes making the road narrower, with half as many lanes. Each lane will be nice and narrow. But don't worry, there'll be a small feeder lane for bikes. So, if you're very lucky, and there aren't any queues of motor traffic, or dozens of buses on this heavily bus-trafficked route, you might be able to squeeze yourself up to the junction and avoid being squashed by a lorry turning left. I exaggerate slightly but the fundamental truth is that, once again, Transport for London is mistakenly going about trying to make London a cycling city by squeezing people on bikes on to ever narrower roads and making them play human speed hump with the buses and lorries. This is not how they'd do it in New York. Or Copenhagen. The consultation period for Euston Circus ended back in February. What happens now is anyone's guess. But my assumption is that Transport for London is having a good old think about all the feedback it's received. It will either go ahead with its original scheme or it will amend it and come up with something that actually includes the sort of cycling infrastructure you'd let your kids cycle down to, say, the British Museum. And I seriously hope that TfL considers doing the latter. Bournemouth council came out this week and announced it plans a network of cycle tracks that are "'Dutch style' cycle paths on a main road..suitable for primary aged children to cycle on." And then, a Conservative Assembly Member, Roger Evans came out and said: "Personally I am in favour of greater segregation where we can do it. 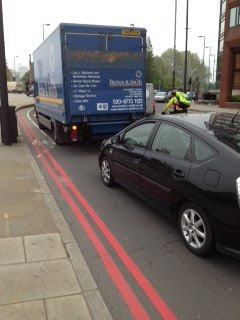 Separate cycle paths remove the understandable fears which come from sharing road space with larger vehicles. This should also be the case at dangerous junctions." And then this happened: London's transport commissioner, Peter Hendy made the following comment to the London Assembly: "I think that one of the things we have learnt is that as cycling increases, since people cycle everywhere on all the roads then we better deal with some of these junctions so that actually they’re designed in the best way they can be". The new deputy chairman of Transport for London, Isabel Dedring, went even further, explaining that she wants to see a more standardised approach to junction design, similar to that being rolled out in New York, suggesting that people on bikes should expect a standard sort of treatment at a junction where it is clear "what level of protection they have, what their rights are, what they can expect motorists to do, and all those kinds of things. "She's absolutely right to flag these things. I reckon the plans for Euston Circus are exactly the sort of junction that Transport for London needs to get absolutely right this time. They have the money. They have plenty of space in both north and southbound direction. They have a large and dangerous junction. And they have an entire cast of politicians and their senior TfL leadership suggesting they need to get junction design right. I'd like to see a junction here that is suitable for my mum to cycle through. Or my young niece. Question is, whether Transport for London will get it right this time. It has had plenty of time to put its thinking cap on. And it has no excuse not to. Mr Hendy, here's a junction where you can prove you've learnt that, as cycling increases, you had better design it in the best way you can for cycling. Your words, not mine. Personally I'd prefer it the way it is now to this proposal. Funny - I thought Camden Council wanted to change Tottenham Ct Rd to a southbound bus contraflow? No evidence of that being taken into account here! It is depressing that they just don't seem to be listening to what the various cycling groups have been saying about safe design across London. I have to go through this junction quite a lot east-west and actually its not 'that' bad currently. Going east to west there is a contra-flow for cyclists which, although not great, does the job well enough. West to east is easy enough on the road. Going either way you can take the underpass, which takes a bit of confidence and a lot of road awareness, as you end up being in a situation where you have to merge into a lane on your left that will have fast moving traffic in it (certainly not a safe route even if you 'keep your wits about you'). Going north-south is an unpleasant experience to say the least.